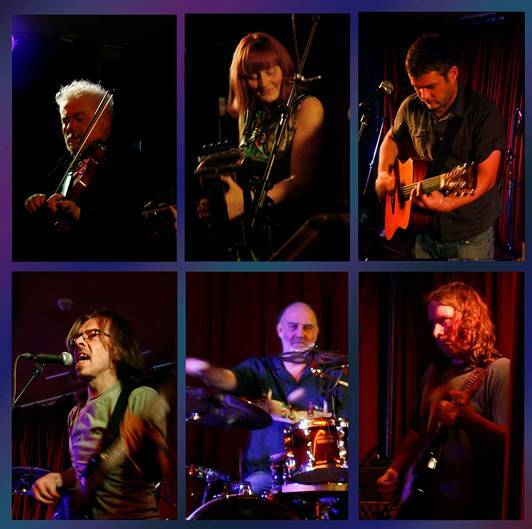 Award winning Irish group Two Time Polka play a fiery mixture of Cajun, Bluegrass and rock ’n roll music. They are not unknown to spice up their live performances with flavours such as tangos, east European tunes and a handful of politically insightful original songs. With four albums to their credit, Two Time Polka has proven popular with radio stations receiving both national and international airplay. In 2005 they toured the US which led to the release of a compilation CD there. In 2011 Two Time Polka were winners in the Best Musical Act category, awarded to them by AOIFE, the governing body of festivals in Ireland. In the last couple of years the band have played numerous festival in Ireland and abroad including such prestigious festivals as: Folkest (Italy), Skagen International Folk Festival (Denmark) and Gentse Feesten (Belgium). In the summer of 2012 Two Time Polka played a show stopping set at Irelands premier festival The Electric Picnic. Two Time Polka, eine irische award-winning Band, spielt eine kernige Mischung von Cajun, Bluegrass und Rock and Roll. Die Band hat den Ruf ihre Auftritte zu speisen mit Stilen wie Tangos, ost-europäische Melodien und eine Handvoll intelligente politisch inspirierten Songs.Mit vier Alben auf ihrem Konto hat Two Time Polka bei nationalen und internationalen Radiosender Ihre Popularität schon bewiesen. Im Jahr 2005 tourten sie in den USA, was zur Freisetzung von einer Kompilation-CD führte. Two Time Polka wurde in 2011 vom AOIFE, Irlands Verwaltungsorgan der Festivale, als Gewinner der Kategorie Best Musical Act deklariert. In den letzten Jahren spielten sie auf mehreren irischen Festivals und auf renommierten ausländischen Festivals sowie: Folkest (Italien), Skagen International Folk Festival (Dänemark) und De Gentse Feesten (Belgien). Im Sommer 2012 hat Two Time Polka das irische Premierefestival The Electric Picnic abgeschlossen. Two Time Polka, une groupe irlandaise déjà récompensée, joue un mélange puissant de Cajun, Bluegrass et du Rock and Roll. La groupe est bien sûr connue d’épicer ses concerts avec des styles comme tangos, des mélodies de l’Europe de l’Est et une poignée de chansons intelligentes politiquement teintées. Avec une discographie de quatre albums, elle a déjà prouvé être populaire avec des stations de radio nationales comme internationales. Une tournée aux Etats-Unis en 2005 a résulté à une CD de compilation. En 2011 Two Time Polka a gagné la catégorie Best Musical Act sous l’oeil vigilant d’AOIFE, le conseil d’administration des festivaux de l’Irlande. Les dernières années elle a joué sur plusieurs festivaux irlandais et des festivaux de prestige étrangers comme: Folkest (l’Italie), Skagen International Folk Festival (le Danemark) et De Gentse Feesten (la Belgique). A l’été de 2012 elle était tête d’affiche du festival d’ouverture irlandais The Electric Picnic. Promoting their new album Fourth Time Round, Two Time Polka played the Newhampton Inn, Wolverhampton. The term unique is often banded about glibly but there truly is nothing quite like Cork outfit Two Time Polka on the folk circuit. Their Americana-inspired music is gloriously foot stomping and wonderfully enthusiastic. Opening with Ode to Billie Joe the mix of mandolin and acoustic and electric guitars complemented each other and blended wonderfully with Aaron Dillon’s voice for the blues song of Hoist Your Windows high. Superb mandolin player Ray Barron gave the first show of his musical prowess when he took the audience to Mexico with el Comancheros then handed over once again to the strong vocals of Dillon for the politically-barbed Brown Envelope. The band continued their musical journey through to Louisiana with the Wafus Two Step and even to The Promised Land. Weaving in between all these was Geraldine Barron who wields her accordion like a pump action shotgun. To banish any doubts about their originality the Dark Side of Macroom blends Pink Floyd with Greek and Jewish strands and though it shouldn’t work the band’s skill makes sure it does. Red-hot and steamin’, straight from the Louisiana swaps (via Cork delta) come Two Time Polka. “Irish cajun bluegrass rockabilly neo-folk” said No Depression magazine. It shouldn’t work but it does. No one comes close for sheer entertainment. Always a huge favourite in Wexford. Probably the best fun of the weekend. Having noticed in Shreds & Patches that Two Time Polka were performing in Shropshire, I decided I would have to get to see them. Despite having visitors most of that week, I figured that Two Time Polka would have to take priority! They are a 6 piece band playing mostly Cajun and American music despite being from Cork. I already knew Ray Barron (probably the finest mandolin player I have come across) and his wife Geraldine (Cajun style one-row 4 stop accordion and concertina) but the rest of the band (Tomas on lead vocals and guitar, Dave on drums, James on bass and Leon on lead guitar) turned out to be not only superb musicians but a really nice bunch of guys too. I saw them play at Tilston Music Club, at the Carden Arms in Tilston, and having received one ticket in advance (I was ‘Billy-no-mates’ that night! ), found it to be a good venue filled with very friendly people, with the only criticism being that it wasn’t big enough! The band played two sets of virtually non-stop music, where even the sad songs were power-driven and foot-stomping. Each one of them played their leads faultlessly, they are obviously well rehearsed and having a good time. I’ve no particular favourite from that night, but I really liked their cover of Bobby Gentry’s “Ode to Billy Joe” (remember that line “…Billy Joe McAllister jumped off the Tallahatchie Bridge”?) which I don’t think they have recorded, maybe next CD? Order all their CDs, you’ll have some great listening, dancing and driving music. If you see them playing near you, you are assured of some great music. Brilliant!